Lindsey first started sailing when she was eight years old in Optimists. She transitioned into the Laser Radial in 2011 when she outgrew Optis, and has been sailing Laser Radials ever since. She is currently a senior at Castilleja School, and will be attending Brown University this coming fall. This summer and spring she will be competing in many international and national Laser Radial events. She hopes to qualify for the US Sailing Youth Development team this spring at Laser Radial Midwinters Easts in Clearwater, Florida. 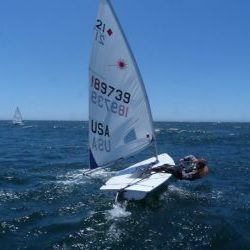 She plans to compete for the Leiter Cup Trophy at the US Junior Woman’s Singlehanded Championships. Her goals for the summer are to finish within the top three girls at each regatta and to finish in the top 10% of the fleet at most regattas.